The first season of The Walking Dead features six episodes, the pilot of which is a double length episode, of this post-apocalyptic zombie drama. At the time of this review a second season of 13 episodes has already been commissioned. Because the first season is so short unfortunately not as many story elements or character's back stories can be explored as some might hope. The pilot episode kicks off with the Sheriff's deputy Rick Grimes (Andrew Lincoln) awakening in hospital, ala The Day of the Triffids. He was involved in a shooting incident and can't remember anything before this, having been unconscious for a few weeks. When he awakens the place is deserted and the dead are walking the streets. He returns home to find that his wife and son appear to have fled in a hurry, making him think they are still alive. When he meets up with a group, the race is on to stay one step ahead of the monsters that can only be stopped by destroying their brains. The remaining five episodes follow the group as they attempt a rescue mission for one of their members and, when their camp is attacked and several of them are killed, they set off for the Centers for Disease Control and Prevention HQ in a bid to see if anyone has found a cure for the plague. 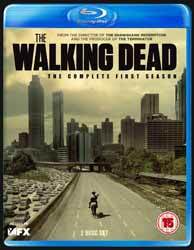 Extras include The Making of The Walking Dead (29 min, 53 sec); Inside The Walking Dead: Episodes 1-6 (31 min, 10 sec); A Sneak Peek with Robert Kirkman (4 min, 51 sec); Behind the Scenes Zombie Make-up Tips (6 min, 45 sec interesting look at how to create your own zombie make-up); Convention Panel with Producers (11 min, 32 sec Comic-Con panel with producers and actors); The Waking Dead Trailer (2 min, 40 sec); and Extra Footage (6 x featurettes). While this is an impressive show, asking fans to pay £35 is a bit steep - although thankfully most online stores are charging just over £20. Also, as mentioned previously, the short run means that we don't really get to know the characters as well as we should before they start getting killed off.